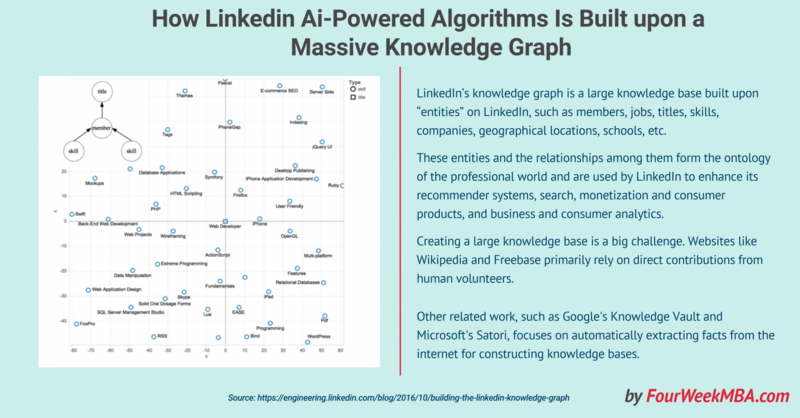 What is LinkedIn’s knowledge graph? LinkedIn’s knowledge graph is a large knowledge base built upon “entities” on LinkedIn, such as members, jobs, titles, skills, companies, geographical locations, schools, etc. These entities and the relationships among them form the ontology of the professional world and are used by LinkedIn to enhance its recommender systems, search, monetization and consumer products, and business and consumer analytics. If you don’t know how a knowledge graph works, think of it as a system made of nodes and edges. Where the nodes are the things that exist on LinkedIn (jobs, skills, companies and so on) and the edges are the relationships among them. How does LinkedIn Knowledge Graph look like? Whys is the knowledge graph critical to make LinkedIn smarter? Creating a large knowledge base is a big challenge. Websites like Wikipedia and Freebase primarily rely on direct contributions from human volunteers. Other related work, such as Google’s Knowledge Vault and Microsoft’s Satori, focuses on automatically extracting facts from the internet for constructing knowledge bases. Different from these efforts, we derive LinkedIn’s knowledge graph primarily from a large amount of user-generated content from members, recruiters, advertisers, and company administrators, and supplement it with data extracted from the internet, which is noisy and can have duplicates. The knowledge graph needs to scale as new members register, new jobs are posted, new companies, skills, and titles appear in member profiles and job descriptions, etc. Auto-created entities are generated by LinkedIn (Inferred): imagine the case in which you entered in your profile the company’s name. Let’s assume you misspelled it. Even so, LinkedIn has to have a mechanism to fix that mistake to avoid to have misplaced data in its knowledge graph. What does it do? Simple, some LinkedIn algorithms will infer what you meant and fix the mistake. As you can imagine, the organic content generated by users (so-called explicit) might have many errors. How does LinkedIn auto-create entities? LinkedIn looks for entity candidates among the data it finds on members’ profiles. This includes information related tens of thousands of skills, titles, locations, companies, certificates and so on. Those are the entities in LinkedIn Knowledge Graph. Those entities represent the nodes. This allows LinkedIn to build a knowledge graph where the relationships are the edges, while the entities or things in the graph are the nodes. Where does LinkedIn get the data to create those relationships and entities? As we’ve seen one crucial aspect of LinkedIn knowledge graph is the production of data. We’ve seen two kinds of data: explicit and inferred. How does it work practically? You can see on the left the skills generated by the member (like “Distributed Systems,” “Hadoop,” “Scalability” and so on). On the right side, you can see the inferred skills, with a certain degree of confidence (“Product Management,” “Management,” “Consulting,” “Networking” and so on). In other words, besides the skills that you point out in your profile LinkedIn algorithm computes a set of skills to make sure to balance the user-generated content. Graph databases shine when you are trying to relate entities (nodes) to each other along relationships (edges). On top of new functionalities, the GraphDB at LinkedIn is heavily optimized, and is able to support millions of queries per second at very low latencies. LinkedIn algorithms have become way smarter. However, AI and machine-learning models need a lot of data to improve. Handling the massive amount of data efficiently becomes critical. The knowledge graph is the infrastructure that allows doing just that. It allows handling complex, structured and vast amount of data quickly and efficiently. That is why understanding how a knowledge graph works is also critical to understand how those platforms are evolving. Other companies that manage a massive amount of metadata (data about data), like Facebook and Google are using the same kind of infrastructure.